For vegans and vegetarians, vegetables and fruits play a major role in their diet. If you shop at supermarkets from greens to vegetables, chances are that your produce may have traveled thousands of miles. Jennifer McCann, who blogs at Vegan Lunch Box, has come up with great tips to save money and the environment. Visit here to read that article. Pav Bhaji is a very popular street food in many states across India. 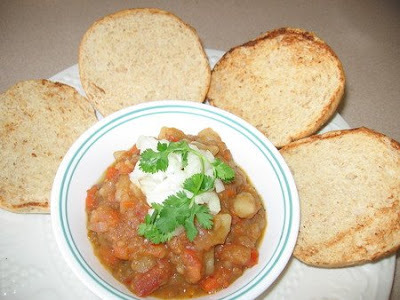 I recently made Pav Bhaji following Susan's Pav Bhaji recipe. I just used potatoes, carrots , bell pepper along with onions and tomatoes to make the spicy vegetables. I think the key for the wonderful taste of this dish is to pressure cook the vegetables until soft. Soy Garden Natural Buttery Spread or Earth Balance® Margarine Natural Buttery Spread. For many years I relished eating pizzas brimming with cheese. One fine day, when I decided to become a vegan, I realised that I could no longer eat pizzas with cheese. As a vegan I started to enjoy eating cheeseless pizzas. 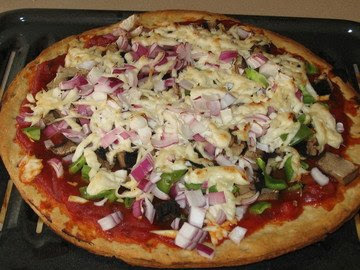 Recently I came across numerous vegan blogs with vegan pizzas loaded with vegan cheese. 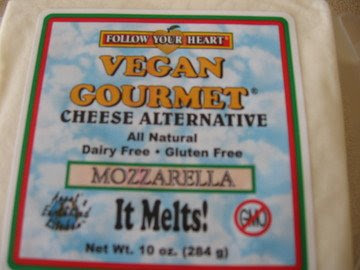 Many vegans had blogged about the Vegan Gourmet Cheese, made by Follow Your Heart. I recently made pizza with vegan gourmet mozarella cheese, and I was surprised to find out that it tasted so much like real cheese. The pizza was delicious! I'm so happy to find a cheese, which not only tastes great but is also cruel-free. Where can you find this delicious vegan cheese? Visit this webpage to find stores which carry vegan cheese. 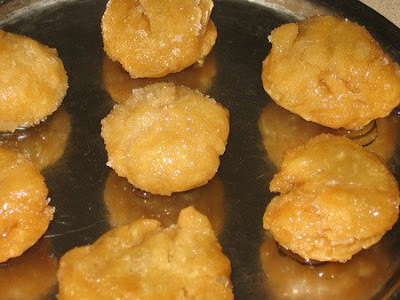 Badushas are deep-fried flaky sweets very popular in India. Growing up, I always enjoyed eating store bought Badushas, as my mom did not make these wonderful sweet at home. Recently I came across Badushas in numerous Indian food blogs, and I decided to make it. I followed the recipe from this blog, because it was easy to veganize. I used Crisco pure vegetable oil, instead of butter and ghee. The number of ingredients required to make this sweet is less, but it takes a long time to make this sweet, since the sweets have to be deep-fried in low heat. These days you can find vegetarian dishes in almost all the restaurants. And it's pretty simple to get vegan fare, if you order your pizzas, burgers and salads without cheese. Sometimes it's nice to visit restaurants where the menu card is brimming with numerous vegan dishes. I'm always on the lookout for new dairy-free icecream. 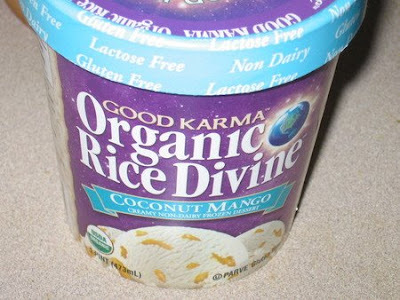 I recently came across, coconut mango - a delicious creamy non-dairy frozen dessert, from the Good Karma Foods, in Zerbos - a health food store in Detroit. also adores coconut mango icecream. but they are also organic, gluten free and trans fat free. Visit Good Karma to find out which stores in your area sell Good Karma icecream.